...and is a worldwide outreach ministering on the continents of Europe, Asia, Africa, North and South America. We offer ministry outreach to prisons, schools and the military, through our Publication Department, Revivals, Chaplaincy Program, Discipleship Institute, and our College of Biblical Studies. For further information on any of these ministries, please go to the Ministries menu. 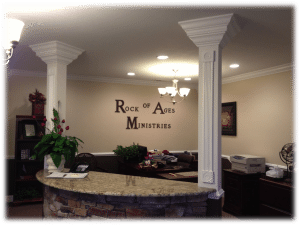 This year marks our 38th Anniversary at Rock of Ages Ministries! We are grateful for the rich heritage God has given to us through the strong, godly leadership of Dr. Ed Ballew and Dr. Ron Gearis. At the close of 2014 God allowed the ministry to surpass a milestone of reaching over 663,037 souls for Christ and discipling over 24,000 students daily in our Discipleship Institute. ...They called it The Rock of Ages Tape Ministry and it was based in their home. Their goal was to be an encouragement by producing audio cassettes for distribution among foreign missionaries. Between 1976 and 1977, churches who heard Brother Ballew preach began requesting copies of his tapes. The requests increased until the Ballew home was no longer adequate for the ministry. Two churches paid for materials and sent men to construct a building on Dr. Ballew's property to accommodate the growth of The Rock of Ages Tape Ministry. To influence every correctional/educational facility in the world for Christ by providing a ministry characterized by integrity and excellence, one that is uniquely designed to meet the needs of the correctional/educational staff and clientele. The Praise of God and glorifying Him in all that we do. The Pillar and ground work of Truth, the local church. The Proclamation of the Great Commission. The Preparation of missionaries for Christian service. The Production of Christians, dedicated to making a difference. The Principles of God's Word and the leadership of the Holy Spirit. The Provision of Bible-based ministries and literature. We believe that the Scriptures of both the Old and New Testaments are verbally inspired of God and that they are the supreme and final authority for faith and practice. We accept the Authorized King James Version to be the Word of God, without error. We believe in a Triune God, (Ephesians 2:18) Who is - GOD THE FATHER, Creator of Heaven and earth, perfect in holiness, infinite in wisdom, rich in grace, supreme in love, and measureless in power. He hears and answers prayer. He saves from sin and death all who come to Him through Jesus Christ.